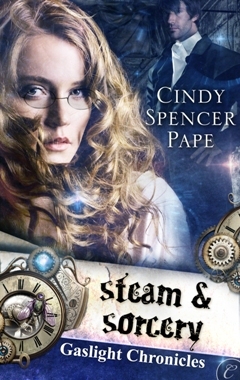 This week’s Danger Gal Friday post profiles Caroline Bristol from Cindy Spencer Pape’s new steampunk release from Carina Press, STEAM & SORCERY. Cindy Spencer Pape has described this story along the lines of “Mary Poppins meets Van Helsing,” which is interesting on its own, but I also enjoyed the Arthurian elements and “easter egg” references to other period books (can you find the PRIDE & PREJUDICE nod?). While she blends all three elements well, what really drew me into the story was Caroline “Caro” Bristol and young Winifred “Wink” Carter. With Caro, Pape managed to create a very ladylike character of the Mary Poppins mold who carries a mean umbrella and knows how to use it. Caro learned of necessity to defend herself against unwanted male advances and is also a crack shot with a revolver. Sixteen-year-old Wink, on the other hand, debuts in the story kicking vampyre arse and taking names. Then we find out what a genius engineer she is. During the course of the story, Wink creates three clockwork animals: a mastiff, a monkey, and a lark. I liked that Merrick never feels the need to out-compete Caro. He respects her talents and never wants her to diminish herself in any way. I also liked that Caro turns out to indeed be “something more than human.” Merrick may be descended from Artorius himself, but Caro has her own otherworldy aspect not to be taken lightly. A steampunk Mary Poppins with an otherworldly twist, I thoroughly enjoyed the world-building and strong characters in this story. STEAM & SORCERY is the first of the Gaslight Chronicles, with a free novella sequel called PHOTOGRAPHS & PHANTOMS available from Carina Press in April 2011. I’m really hoping to see a grown-up Wink in a future story.